Full color daily wall calendar. 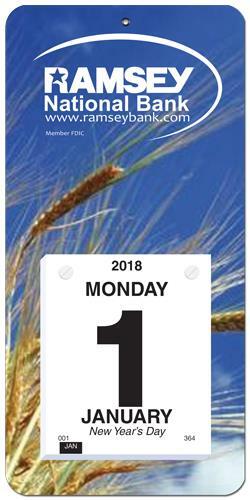 Size 6" x 12 1/4" daily wall calendar looks great in any office, shop or home. White cover stock printed full color and mounted to heavyweight board with white posts and four round corners. Bleed on all sides at no extra charge. 365 sheet pad printed in black ink only on white offset. Submit custom artwork for a unique promo that projects your brand identity or select from our stock backgrounds. Great employee giveaway! Size: 6" x 12 1/4"